Just a quick post because I finally finished this doily. I think I crocheted each motif twice, maybe more to get it to go together. 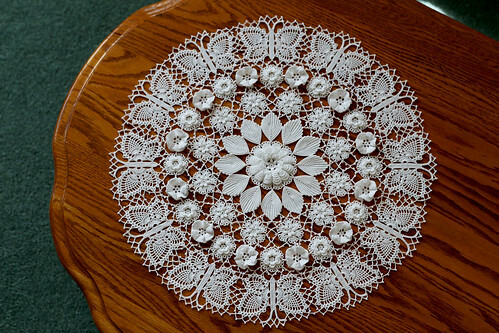 I made this doily in ecru 15 or so years ago. This is my second one. The joins are wonky on the pattern, pull funny in places, and thought I could do it differently. I should have done it 10 years ago, because with my aging mind it seemed much harder to figure out than I had imagined. It does photograph well and I am so glad it is finished, wonkiness and all. There are other photos on my flickr page. I am starting another crochet edging lace that I have wanted to make for a long time. Each 2 1/2″s of lace have one of these little baskets. I think they are cute, the rest of the pattern is scallops. I had to play with these instructions too. The pattern is a Burda graph and the sometimes the amount of stitches and their exact placement are only a suggestion. I think I have worked out what I want to do to keep the baskets circular. Neither of these are exactly what I am doing, but close. The bottom one has more doubles in the leaves, which keeps the center hole from stretching out, and the top one the basket top edge is straighter. I think I have worked out a compromise where I can get both in the finished basket. 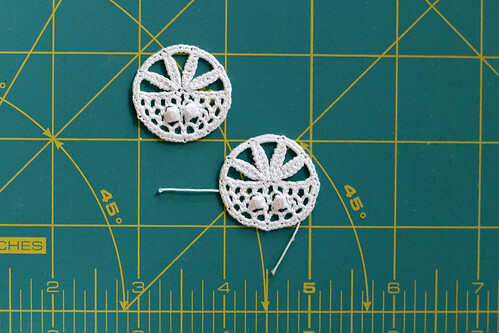 The motifs are so tiny, just over 1″ in diameter. I finished up the little toothbrush rug to go in front of my kitchen sink. This is really a fun technique that I hope to be able to do again. I love the look of the batik fabric, but it is usually too expensive to use for a rug. 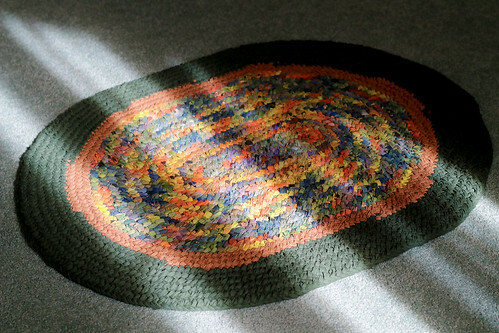 I will be on the lookout for it in clearance bins like the piece that I used for this rug. Finally has anyone played with the Rainbow Loom to make rubber band bracelets? Where we live it the in thing for the 6 to 10 year old crafter set. I was curious about them, so my son being sweet bought me one for Valentine’s Day. It isn’t something I would actually buy, since we do not have any little crafters in our family yet. I went though the whole lot of 600 rubber bands in one day even taking finished bracelets apart to do another setup. It was a time waster, but fun, like sudoku, or origami. I can see why the kids like them so. They are squishy and stretchy. This entry was posted on Tuesday, February 18th, 2014 at 11:42 am and is filed under Craft, Crochet, Doily, Lace and Needlework. 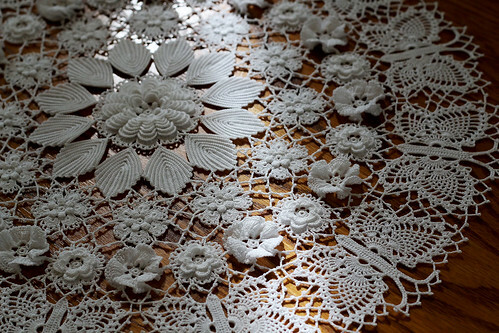 Tagged: Craft, Crochet, Doily, Irish, Lace, Needlework, Photo. You can feed this entry. You can leave a response, or trackback from your own site. You have accomplished something seldom seen anymore – how gorgeous!! Great to see your post!! Wow! Very intricate. I love the butterflies but the center is absolutely amazing. I could look at it for hours! I haven’t used a Rainbow Loom but know they are super hot hot hot. I’ve seen some pretty interesting things made with them. YouTube may have some tutorials. I can definitely see the appeal! I haven’ t heard of a Rainbow Loom (maybe they’re not sold over here?) but have been thinking about a little loom I had with jersey loops. This was over 50 years ago – I made more potholders than the Western World needed, but loved it. I have to agree with all the above. Your work is exceptional and I really wish I could do this.